We appreciate your interest in improving your health with us. We started this integrative medical practice intending to take care of our patients in a manner that is rare nowadays. We had hoped that traditional insurance reimbursement would adequately compensate this style of medicine, but it does not. Insurance reimbursements are designed to provide modest payments for numerous interventions. This is why the average office visit lasts only 7 minutes and only covers “medically necessary” treatment; integrative and holistic treatments are typically not covered. This structure requires a large patient pool with abbreviated patient interactions, and reimbursement has decreased over the years while costs have increased. We do not wish to deliver suboptimal care in order to conform to insurance reimbursement structures. As such, we have implemented a membership model to align reimbursement with our unique holistic offerings. Our membership cost is quite modest when compared to what most folks pay for a daily cup of coffee, cable television, or cell phone bills. We hope you prioritize this investment in your health. If you choose to pay annually, you will receive a 5% discount. Please consult your accountant about whether your membership fee is an eligible expense for your Health Savings or Flexible Spending Accounts. Please know that we will treasure being a part of your life’s journey and we hope with all our heart to work with you in our quest toward optimal health. It’s not if, but which membership is right for you! If you plan to utilize just one feature of a membership, it more than pays for itself. The easiest way to identify which membership is right for you is based on the name. If you deal with intermittent pain, the Live Pain Free plan would be a good fit. If you are interested in losing weight or maintaining a healthy weight, then Live Slim would be the plan for you. If you are interested in antiaging and hormone optimization, then check out our Live Well, Age Well plan. Wanting to balance your hormones? If you are on hormone pellets the saving on the Live Well, Age Well plan basically pays for the rest of the plan. It also includes breast thermography, unlimited infrared sauna and whole body vibration, 2 Skinceuticals medical peels per year, and 1 hyaluronic microneedling treatment. The Live Slim plan includes 8 sessions to get you started. In addition, you get unlimited infrared sauna and whole body vibration plus 6 fat burner injections. You may want to check out our Live Pain Free plan that includes 12 sessions of spinal decompression as well as 10 sessions of hyperbaric dives and unlimited infrared sauna and whole body vibration. Having a hard time deciding between two plans? Don’t worry! The Well 4 Life plan has it all. Why you need this membership! In 2010, a study by Klemes et al. showed that patients between the ages of 35 and 64 who were on Medicare and also utilizing concierge medicine overall experienced a 79% reduction in hospital admissions compared to patients not participating in concierge medicine. Similarly, there was a 72% decrease shown for patients with other co-existing commercial insurance. Additionally, members of a concierge practice were readmitted to the hospital 97% less frequently for heart attacks, 95% less for heart failure, and 91% less due to pneumonia. This resulted in savings of over $300 million in only a year. As the old saying goes, "An ounce of prevention is worth a pound of cure." I firmly believe that focusing on “health care,” not sick care, and being proactive rather than reactive is the solution to the current rising costs of healthcare that we face. We have structured the plans, so that if you are already utilizing some of our services on a regular basis, signing up for a membership option will be more cost-effective membership. For example, if you are a woman on hormone pellets, the annual savings alone from pellet insertions will be $200. That alone almost covers the Essentials package not taking into account any of the other discounts and benefits you will receive. Having your life back and owning your future? I truly believe this is priceless. Here’s what I know...we can put up with a LOT when it comes to pain and discouragement - and just keep going. But it’s not really a life. It’s an exercise in endurance, and called “suffering through life”. We believe that you can have all that, and what’s more, you DESERVE it. If you also add in your ability to live fully, less sick days at your job - or even jobs LOST over disease, and spending less time overall at the doctor, the impact of investing in the Well Life Membership programs is immeasurable. And know that we are one hundred percent on your side. 100%. What's currently your BEST Return on Investment (ROI)? Your house? 401K? Stock market investments? No! Your Health is your first Wealth. You only have one body, there are no returns or exchanges. How have you invested in your health? We strive to make Well Life's memberships among one of the most affordable expenses you have. How much did you spend on your coffee today? For less than 1 dollar a day you can join our membership and start taking control of your health today! Invest today to become the best version of you. If you think that you are too busy to make time for your health now, then plan to be busy later with doctors' visits. There is no easy way out. Sometimes I hear people say that functional medicine simply isn’t affordable, but if you do a cost comparison between conventional and functional medicine, functional medicine wins every time. The only difference is who is paying for the care. With the insurance model, the system is paying instead of the individual, but the individual always pays for it in the end. Getting a cheaper plane ticket to the wrong destination is not the best way to get somewhere, so remember that you get what you pay for. Do you want a QUALITY life? So make an investment in your health by signing up today for less than a dollar a day! What do you want your last 10 years of life to look like? Make Health Last. What will your last 10 years look like? + Q) Can the online supplement discounts be applied to in office supplement purchases? + Q) If we sign up for a couple’s or family membership, are the membership benefits per family member or as an entire family? A) The membership benefits are per individual and can not be shared among other family members. + Q) Can I make changes to my membership package after I sign up? A) Yes and No, You are able to upgrade packages at anytime, but you can only downgrade packages at your annual membership renewal. 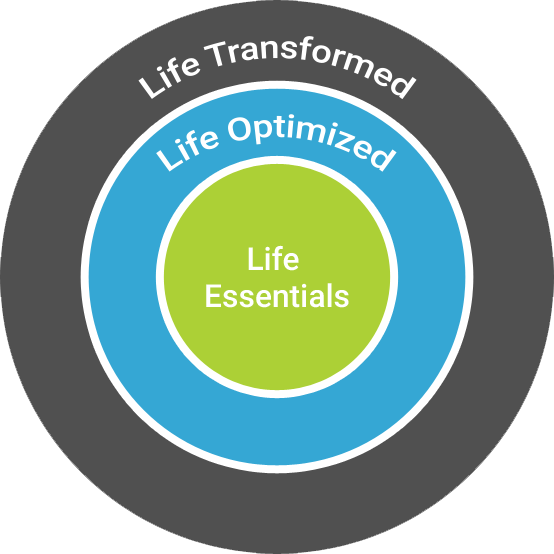 This means, if you want to sign up for an individual life essentials package (the lowest package option), you would be able to upgrade to life optimized, or life transformed at any point. You are also able to upgrade to a couple’s membership if your spouse joins the practice at a later point, or to a family plan if everyone in the family wants to benefit from the membership. You can’t however switch between different life optimized plans throughout the year as the services included change and due to our extremely affordable pricing, this is unfortunately not an option. If you find yourself needing several categories within the life optimized packages you may consider the life transformed package as it includes all the benefits of all packages. + Q) If I choose not to join a package, will the level of care I receive be affected? A) No, we want to reassure you that the level of care we offer our current patients is not changing. We will offer the same great comprehensive care and lengthy visits whether an individual is a member or not. These are part of our core values and why we started the clinic. We believe, despite declines in insurance reimbursement, offering the memberships, will enable us to maintain our quality visits/care at a reasonable price. The main difference between a member and nonmember status will be the bundling of services and discounts on some of our therapies and services. + Q) If 2 or more family members want to participate in the membership do they have to choose the same package? A) Absolutely not, this is the whole reason we have created choices with the memberships so that individuals can pick the package that will help them achieve their goals the most. + Q) I am a current member and would like to keep my current package is this possible? + Q) If I become a member do I get any guarantee to be seen in the clinic when needed. The Well 4 Life plan has it all. So if you are looking to have a complete health transformation this is the plan for you. A one-year commitment is required, and will be billed monthly. There is a 5% discount if paying for a full year in advance. If you choose to be billed monthly, and would like to cancel before your annual renewal there will be a $50 fee plus the nonmember price of any of the perks you used during your membership. *Assuming you are on Pure One Multivitamin $33/2months, Orthobiotic $33, and Barleans Fish Oil $33.38 and utilizing all included services and treatments. **Assuming Methylgenetic report, 12 Body composition testing a year,6 basal metabolic rate testing, one CIMT scan, 1 Upper Body Thermography scan, 2 Bioscores, 4 VO2 Max testing, 4 Max Pulse test, 1 Nutraval test, 4 gallons alkaline water a month, Unlimited Whole Body Vibration, Unlimited Infrared Sauna, 12 EWOT, 10 Sessions of Hyperbaric Oxygen,12 sessions of spinal decompression, 1 hour Cryolipolysis, 6 laser lipo treatments, 6 fat burner injections, 4 acupuncture treatments a year, 4 Prolotherapy sessions, 2 PRP Treatments, 1 Stem Cell Treatment, 1 IV therapy session, 140 units of botox a year, 2 syringes of juvederm, 1 microneedling sessions, 2 peels, and 8 nutrition/exercise visits assuming a $25 copay. The Live Slim plan includes 8 sessions of nutrition/fitness health coaching/personal training sessions to get you started. In addition, you get unlimited infrared sauna and whole body vibration plus 6 fat burner injections. Our Live Pain Free plan includes 12 sessions of spinal decompression as well as 10 sessions of hyperbaric dives and unlimited infrared sauna and whole body vibration.